ALIO Industries has focused on nano precision motion for over 10 years. During these years ALIO engineers have passionately developed products, manufacturing techniques and intellectual property (IP) for 6-D Nano Precision™ in the True Nano™ world. ALIO does not build legacy products or overlook the 6 dimensional errors associated with simple linear motion. ALIO designs and manufactures with these issues in focus with new unique manufacturing techniques and leading edge components then tested to NIST traceable nano results. ALIO linear products have been designed and manufactured to have no equal in the world for performance and reliability. ALIO’s mechanical bearing stages bearing stages can perform at a level of precision that the competition struggles to match with their air bearing stages. ALIO’s focus on 6-D Nano Precision™ only while others design and build to the 2-D world of planar repeatability and accuracy keep ALIO on the leading edge. All of the product families of ALIO linear stages have world class performance with variation of components such as motors and encoders to fit demanding applications or cost sensitive systems. Parallel Kinematic Robotics, ALIO Industries (US patents 6,769,194 and 6,671,975) parallel kinematic Tripod 3 axis and Hexapod 6 axis robotic systems promise to revolutionize the manufacturing processes and inspection of products requiring nanometer precision. In 2001 ALIO designed, built and patented the first True Nano™ precision Hexapod and Tripod robots. Over the years the ALIO Hexapod has been the standard for nanometer applications requiring a Hexapod robot. The TRUE NANO™ ALIO Hexapods with nanometer precision revolving around a virtual point in space with tool center point programming coupled with speeds of up to 250 mm/sec these robotic products form the basis of the next generation of automated nano-positioning systems for the most demanding applications in photonics, packaging, test, micro machining, government, measurement, medical and semiconductor manufacturing. For descriptions of systems available, please read on below. For specifications, and datasheets for download, please click here. ALIO Industries has development leading edge 6-D Nano Positioning™ air bearing motion system for a wide range of applications in manufacturing, inspection/repair and metrology. With several patent pending designs for Planar and Nano Z™ ALIO is well positioned for the next generation application demands of TRUE NANO™ precision in PV, Semiconductor, Ink Jet Deposition, Lithography and Optical Inspection. ALIO Industries’ Z-Lift motion platforms were created to replace the inaccuracies of the ever present Z-Wedge vertical stages as well as reduce the footprint and improve performance of linear stages mounted in the vertical orientation. Every component in a motion stage adds to the total error. Since Z-wedges have a minimum of three machined components with complex angles, three sets of bearings, a motor via a coupling and an encoder, the result is a very inaccurate stage. ALIO answers this with a family of very high accuracy, high repeatable vertical stages. For specifications and datasheets for download, please click here. ALIO Industries has developed TRUE NANO™ precision rotary stages to meet and exceed today’s demand for high precision rotary motion. Our line of rotary stages continues to expand as we are willing to work with our customers to provide solutions that meet all their needs. Mechanical bearings rotary stages have been design with crossed roller bearings for improved stiffness for offset loads and rotational precision. Integrated with servo torque frameless motors these stage can handle most application where the mass and acceleration needs are extreme while still maintaining our nano precision performance. 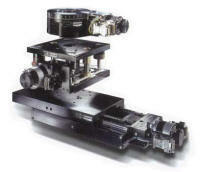 The ALIO attention to materials and machining is maintained in the rotary product line as with the linear products making sure the bearings and metal are located in ultra-machined parallel surfaces as shown by the machined lands on all stages. ALIO rotary stages have standard with 0.2 arc-second repeatability with the ALIO supplied motion controllers. Standard mechanical crossed roller bearings are rated at 13 to 20 microns of radial and axial run-out with optional run-outs of certain models below 5 microns. The mechanical bearing rotary stage family has multiple motor sizes to meet duty cycles as well as mass and acceleration needs from 80 mm to 300 mm in diameter. ALIO Industries has quickly become a world leader with nano-precision vacuum stage and robotic systems. All ALIO products with exception of the air bearing systems are UHV compatible. Linear, rotary, open center X-Y, Hexapods, Tripods and goniometer stages and systems are available in HV (10-7 TORR) or UHV (10-10 TORR) with ultra low outgassing material and components all carefully prepared and baked. Nanometer management of motion is becoming more pervasive in industry as leading edge technology pursues a common trend of working on smaller and smaller scales. This trend is prevalent in numerous positioning sensitive industries, such as fiber optics, bio medical, micro machines, electronics, semiconductor, energy, optics, aerospace, Synchrotrons as well as other research and development. Nano-positioning applications have demanding requirements that are further complicated when the management of motion is under vacuum or when requiring extended travel, finer repeatability, higher speed, greater uptime and of course, lower cost. The challenges of engineering and selecting components that must work together in perfect harmony to achieve nanometer precision are not to be under estimated. The drive mechanism, bearings, feedback system, motion controller, kinematic structure and the environment all need to be designed to perfection to meet nanometer precision in atmospheric or vacuum environments. The vacuum challenges vary from 10-3 TORR to 10-12 TORR from positioning performance to outgassing challenges. LG Motion have recently launched a new piece of software to make laser machining and 3D printing easier. The release of new CAD/CAM software from Polaris enables a machine operator to be able to design parts, import part files run by the machine and inspect the finished product. The single piece of advanced software also controls the laser source, positioning stage, galvoscanner and machine vision camera. Working closely with a number of specialist motion control specialists we are able to offer complementary products that enable our engineering team – and our clients – with a comprehensive range of motion control solutions. Polaris Motion specialises in the design and development of control solutions for CNC machines in laser-based manufacturing, diamond tool cutting and grinding of optical surfaces and for other specialised CNCS used in high-performance applications. LG Motion are pleased to announce an improved stock programme for Schneeberger Linear Technology profiled BALL MONORAIL Linear Guides and a cut-to-length service that has grown in popularity since it's first introduction in 2006. Recognising the growing need for fast response on key items, the range of size 15, 20, 25, and 30 precision linear rail with various carriage types and accessories has been increased to meet demand. LG Motion work with OEMs, specialist machine builders and integrators to design-in and implement the complete range of "MONORAIL" profiled linear rails and guideways for applications requiring large load carrying capacity, precise positioning, high stiffness and an ability to withstand shock loading. LG Motion has a unique working knowledge and experience of Schneeberger linear bearings, having been building its precision rails, bearings and slides into standard and custom engineered positioning systems for some time. Ball bearing based recirculating linear guides are also available as well as circulating and non-recirculating cross roller bearings, complete slide assemblies and positioning tables.